Andalucia, 31 W. Carillo St.
Gallery hours: 9 a.m to 9 p.m.
One might logically view longtime local artist Mary Heebner's latest exhibition, "Strata," at Ro Snell as a companion piece or counterpoint show, following on the heels of a show by her husband, photographer MacDuff Everton. Both visited Patagonia with eyes and minds wide open, and each artist brought back very different, personal impressions of this legendary end of the Earth. Everton, who has collaborated with Heebner in the past, was the "straight" man in a sense, whose characteristically panoramic landscape images offered lavish and evocative reportage. Heebner's work, by contrast, goes beneath the surface, both literally and figuratively. Mixing standard-brand art materials and actual earth and earth pigments, the artist manages to depict the secret life of fossils while also drawing on the visual energies of abstract design. The Patagonian impressions here have been filtered through Heebner's eye and sensibilities, leaving a trail of associations to the sundry stops in the artist's background. Over many years, the longtime Santa Barbaran artist has worked as a collagist, assemblage and conceptual artist, mixing media and approaches to suit the series or obsession at hand. With this body of work, the artist is part self-commissioned archeologist and part abstract impressionist on a quest to create art with a complex agenda. These pieces seem very much about things planetary -- about geological strata and fossils -- while also maintaining a link to the inner landscape. It's a tricky balance that she manages to pull off and with a kind of disciplined expressiveness. In her artist's statement, Heebner provides some background, equating the transitory nature of both organisms and creative activity, and their lasting remnants in the form of fossils and artworks. From her trip to Patagonia, she remembers the sight of riverbanks crammed with fossilized seashells and bone, vertically layered to imply time's passage. Direct contact with unspoiled nature has been translated into the artistic-geological palimpsest of pieces like "Riverbed" with its range of earth tones and rough, palpable surface. Splashes and swirls of mysterious subterranean materials and submerged stones summon up visions of scientific inquiry. Or else we're allowed to "read" the image on more purely artistic basis. The healthy tension of interpretation is an ongoing subplot in the exhibition. 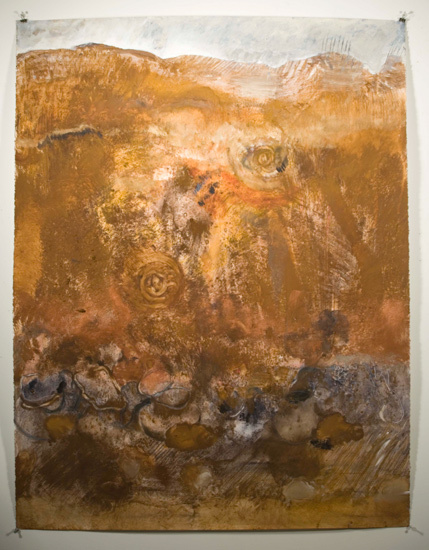 "Strata and Sealily 2,'' one of several smaller, vertical compositions, contains a ghostly impression of a sealily laid atop the sedimentary layers. Strangely, it recalls the neo-expressionist David Salle as much as Mother Earth. From her series "Patagonia Below and Beneath," we find highly abstracted observations of how both nature and artistic curiosity work. 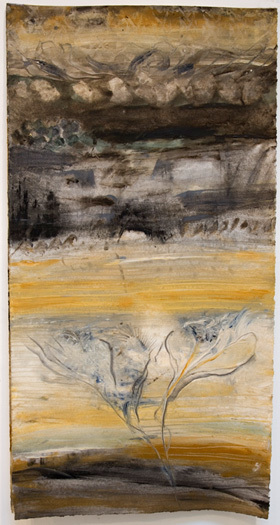 In "Cerro Dorotea," Heebner conveys the sense of both the solidity and flux of nature, above but mostly below Earth's surface. Also in her statement, Heebner reflects on Patagonia and, beyond mere admiration for the wonder and beauty of nature, also follows reason and science into more ominous corners of concern. "Geography is fate," she writes. "I can't help but think of the glut of carbon dioxide, the diminishing aquifers and the global warming that hastens our own destiny." This comment is hardly just a savvy reference at the time when "An Inconvenient Truth" is serving an important public wake-up call to dire climatic perils. Any artist dealing directly with the subject of the planet earth must also, by definition, confront the dark side of the subject, having mainly to do with crimes committed against the planet by the species that invented art. Among other things, Heebner's show is about natural beauty, artistic/spiritual response and, incidentally, environmental fragility.